Ulfr the Blind is a Nord bandit sitting at a table in White River Watch. He guards the lower exit of the cave, quite a feat considering his blindness. He is the uncle of Hajvarr Iron-Hand, the leader of the group. He can be found reading his blank book, Ulfr's Book, at the table. 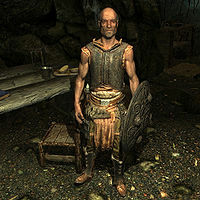 Ulfr wears a leveled set of heavy armor, including a cuirass, a pair of boots, a shield, and a 50% chance of a pair of gauntlets. All of this armor can be up to steel plate in quality except the shield which can only be up to steel in quality. He carries a small amount of gold and may also have a lockpick in his possession. In combat, he relies on a leveled one-handed weapon which can be up to elven quality. When he hears you approach him, you will be forced into dialogue with him and he will ask, "Eh? Who's there? Rodulf, that you?" You will then have two options to respond with. You may answer "Yeah. ", and he will believe you and say, "Boss was looking for you - said he'd be up at the summit. Better not keep him waiting." If you talk to him after choosing this option, he will simply say, "Good luck out there." Alternatively, you may choose to tell the truth and answer "He's dead. You're next. ", causing him to call out for help: "Hey! Somebody get down here! Help!" This will cause two additional bandits to spawn and rush to Ulfr's aid and all three of them will then begin to attack you. According to a note from Hajvarr, it appears that some of the other gang members are making fun of Ulfr, presumably because he is blind. As you venture further through the cave, you will hear two bandits conspiring against Hajvarr. One of these bandits seems to be quite fed up with having Ulfr as a watchman and will agree to the rebellion, saying, "...Yeah. We can't have that rheumy-eyed fool as our watchman, even if he is Hajvarr's uncle. Time we dealt with both of them." If you kill the two bandits that come to Ulfr's aid and then sheathe your weapon when fighting him, he'll stop fighting and return to the table where he was sitting. Despite being blind, line of sight still seems to affect whether or not he can detect you. This page was last modified on 11 May 2016, at 17:11.